Type DME radial-leaded, mini-dipped capacitors deliver virtually the same performance of other capacitors physically twice as big. Improvements in film technology permit the use of thinner dielectric and make Type DME the choice for all but higher current AC applications where the larger size may be an advantage. Type DME self heals shorts caused by overvoltage transients. For small size and low cost, Type DME is tops. Please Note: These capacitors will store dangerously high voltages for a short period of time. Before handling, short circuit the capacitor after use. Perhaps the most overlooked aspect of relay control is proper handling of inductive loads. Inductive loads can best be defined as anything with a magnetic coil, such as a motor, solenoid, or a transformer. Controlling a inductive load using our relay controllers requires the use of induction suppression capacitors. The purpose of this capacitor is to absorb the high voltages generated by inductive loads, blocking them from the contacts of the relay. Without this capacitor, the lifespan of the relay will be greatly reduced. Induction can be so severe that it electrically interferes with the microprocessor logic of our controllers, causing relay banks to shut themselves down unexpectedly. In the case of USB devices, customers may experience loss of communications until the device is reconnected to the USB port. Unlike inductive loads, resistive loads such a incandescent & LED lights and element heaters (without a fan), do NOT require an induction suppression capacitor, and will NOT benefit from its use. Choosing the correct induction suppression capacitor is simply a matter of choosing the maximum voltage requirement of the device you are trying to control. 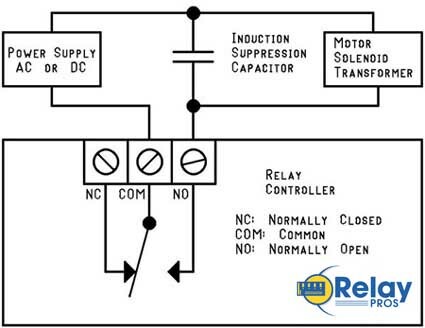 As you can see from the diagram, a induction suppression capacitor is very easy to install. The capacitor should be located as close to the relay controller as possible, and is connected in parallel with the load you are trying to control. Induction suppression capacitors are NOT polarized, and may be used in both AC or DC applications. Most NCD devices are powered from a 12V power supply. NCD Devices REQUIRE a CLEAN Computer-Grade Regulated Power Supply. The power supply used to supply power to the board should not be shared with inductive loads. For instance, you should never use a single power supply to power a the board and a 12V DC Motor. Doing so will introduce extremely high-voltage spikes that will damage the logic and power regulation portions of the board, and in many cases, thethe board will NOT BE REPAIRABLE. The only known exceptions to this warning are customers who are working in automotive or other battery-powered applications where induction is naturally suppressed by integrating a large battery into the design. Filtering circuits may also be used to clean the power supply before entering the board, provided they are properly designed to work with your particular inductive load. USB is particularly sensitive to inductive loads. USB establishes high-speed communications with the motherboard of your PC. If an error is presented on the USB port, the motherboard of your computer will disconnect the device from the operating system. In the case of USB relay controllers, you will lose communications until the device is unplugged from the USB port and plugged back in. When working with USB communications in combination with inductive loads, it is absolutely essential that induction suppression capacitors are used to help prevent loss of communications. Even with these capacitors in place, the possibility does exist that capacitors will not suppress enough induction to prevent periodic communications loss. This capacitor is led free and RoHS Compliant. If your requirements are for RoHS compliant parts this capacitor is manufactured with RoHS compliant led free materials.